What happens when sound is being absorbed rather than reflected? How do we, subconciously, use spatial hearing to navigate space. Experience variations from absolute and pressing silence to illusions of soundcapes in the anechoic chamber at Haukeland hospital, one of the most fascinating place to be found in Bergen. The sound installation “Lontano” lasts about half an hour and can be experienced during the Borealis Festival – from 6 to 10 March – every hour between 12 and 16. NB! There is very limited space – only 4 people at a time – so sign up for a viewing at hollieharding@gmail.com (and CC to trond@trondlossius.no)! NB! There is very limited space – only 4 people at a time – so sign up for a viewing at stine@borealisfestival.no! 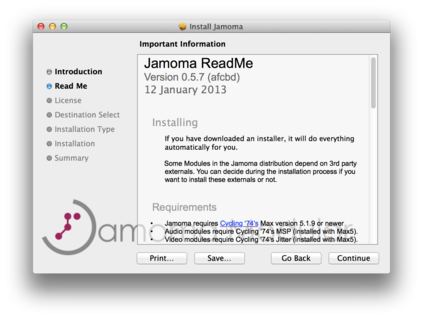 We are happy to “announce”: the release of Jamoma 0.5.7 for Mac. Please visit the Jamoma download page to grab a copy of the installer. The issue of interdependencies of frameworks between Jamoma and TapTools has been resolved once and for all. If you also use TapTools, be sure to install the latest beta. From there on Jamoma and TapTools should be able to happily co-exist, without future updates to one of them also requiring the other to be updated. Several issues have been addressed relating to AudioGraph, the multi-channel audio solution used for all of the spatialisation modules, improving stability and performance. Full support for dataspaces has been implemented. This means that e.g. gain levels in modules can now be specified as MIDI, linear or decibel values. The Jamoma web site has been overhauled. We now have a growing number of tutorials on how to use Jamoma. If you have questions or suggestions, we encourage you to make use of the new possibilities for commenting on tutorials and blog posts. We’ve done extended work on implementing systematic unit and integration testing. We believe this to have a major impact on the stability and reliability of Jamoma. If you experience any problems with this installer, please report, either in the comment field for this post, or via the forums and mailing lists. Unfortunately we still have no recent Windows installer. We hope to be able to remedy this over the comming year, and we are grateful for recent donations towards Jamoma. Part of the donations have been used towards a Windows 8 installer. Still, if you have experience with compiling for Windows and would like to contribute towards the development of Jamoma, we would very much appreciate your assistance. Currently we are fortunate to see funding for Jamoma development that help propagate further development. BEK receives funding from the County Council of Hordaland for development of Jamoma 2012-2014, and GMEA is heading the 3-year industrial research project OSSIA (Open Scenario System for Interactive Application). And finally Nathan Wolek from Stetson University visited BEK as a Fulbright Scholar in the fall 2012, making good progress porting Granular Toolkit to Jamoma. So stay tuned, we’re likely to see lots of exciting Jamoma development over the next few years! Warming up material for future appearances on unfinished floors… from Verdensteatret on Vimeo. I spent last week in Oslo with Verdensteatret (check out their new web site). During the week I did a thorough presentation of various spatialisation techniques as implemented in Jamoma, and we then experimented with different ways of using them to generate material and modify existing material for their upcoming production. We also spent an evening listening to the lovely, brilliant and inspiring “Far West” by Luc Ferrari, but that’s a whole different story. In the aftermath of the work session i’ve been writing up some notes on the various spatialisation techniques. The notes, in Norwegian, are available here.